Alkame Dragon Boat Services is a multi-faceted organization that specializes in everything related to the Dragon Boat industry. We have multiple types of rentals available, run both private and community-based events, specialize in training and certification, provide coaching and steering to teams, as well as many other avenues. Whether you are looking to simply rent a boat for your team, looking to start you own community event, or just want to know more about the sport of Dragon Boat, Alkame Dragon Boat Services is where you will find it. Please take a look through our website and contact us with any and all questions that you may have. We are dedicated to working with our clients to customize a program that will suit your needs. And we promise, if it’s related to Dragon Boat, we can help. Founder, Owner and Operator of Alkame Dragon Boat Services, Scott has been a part of the Dragon Boat community for over 20 years and during that time has become a core member of the sport. He is currently the President of Dragon Boat Canada, the Founder and Head Coach of Pickering Dragon Boat Club and has been the Head Coach of Team Canada Senior A since 2013. 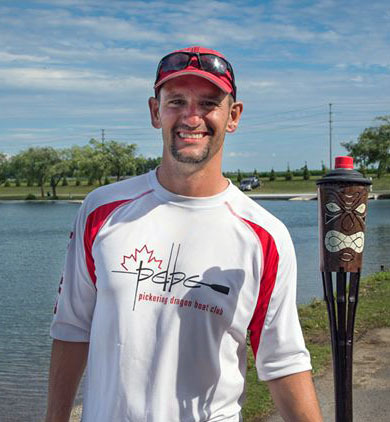 Scott has had the opportunity to represent both his club (PDBC) and the Canadian National team at multiple international events, with his crews becoming both National and World Champions multiple times. As a coach he has had the opportunity to represent his crews in places like Italy, South Africa, Hong Kong, Australia and Czech Republic (to name a few). Scott not only has a high level athletic history, but he is also still an avid paddler, has worked with multiple school, community and corporate groups, has an Honours Bachelor of Arts in English & an Education Degree, has been awarded a Key to the City for Pickering, and has even held a world record with the Guinness Book of World Records for the Longest Distance Travelled in a Dragon Boat. A great story-teller, Scott has a terrific ability to weave themes and teachable opportunities into your adventure. He does this using terrific communication skills and a genuine care for providing a lasting positive experience. He has a desire to see broad-based growth and development of Dragon Boat Racing through properly trained coaches, grassroots and youth development programs and this has become his focus through Alkame. His passion for the sport is always at the forefront of everything he does.